I am thrilled to share a recently published special issue of Theory Into Practice focusing on Twenty Years of Multiliteracies: Moving from Theory to Social Change in Literacies and Beyond. As a project that my co-editor Robyn Seglem and I started in 2016–twenty years since The New London Group’s seminal publication—this issue brings together leaders across the field of education exploring how multiliteracies, pedagogy, and “social futures” have shifted classroom practices and educational research. I describe a little bit more about what drove Robyn and I to pull this issue together below but, really, I encourage you to go to the Theory Into Practice page and dig into the amazing work of our contributors. The changing technological and organizational shape of working life provides some with access to lifestyles of unprecedented affluence, while excluding others in ways that are increasingly related to the outcomes of education and training. 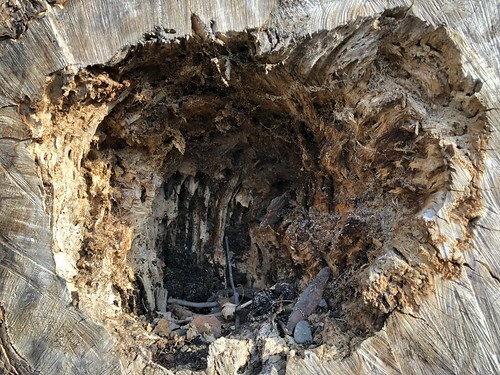 It may well be that we have to rethink what we are teaching, and, in particular, what new learning needs literacy pedagogy might now address. [T]he framework for “designing social futures” at the heart of this issue was written long before the existence of online social networks like YouTube, Facebook, MySpace, Friendster, Instagram, Snapchat, and Twitter. Technical advances from “smart” phones to internet-enabled thermostats, doorbells, and fitness trackers had not yet redefined our relationships to “stuff” at the time that multiliteracies outlined new modes of communication and understanding. Though advances in technology were still seen as central to the hopes of educational reform in the U.S. (Cuban, 1986), entire ways of interacting and communicating with one another and mediating the comfort of middle class lives did not exist. Similarly, Amazon, Uber, Warby Parker, Blue Apron, and myriad other companies did not reimagine new modes of commerce. In 1996, rather, media such as books, music, and VHS tapes were largely bought in malls; the ushering out of smaller mall-based bookshops like B. Dalton and Waldenbooks had not yet happened and larger shops like Barnes & Noble were not the threat to mom and pop shops that today’s eCommerce behemoths may be. New content was not yet downloaded (illicitly pilfered or paid for) from online sources. Illustrating the kinds of advances that we have seen in the years since the New London Group’s publication, let us consider “the boy who lived”: Harry Potter. In 1996, the first book in J.K. Rowling’s Harry Potter book series was still a year away from being published. 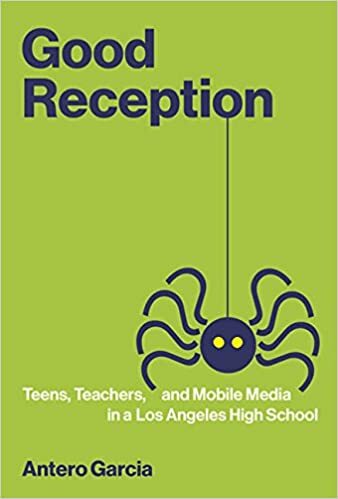 This publication, in turn, would not only get caught in the hearts of millions of readers (many impatiently awaiting magical owls bearing invitations that would somehow whisk them to their own wizarding school experiences) but would also redefine the markets for publishing young adult and children’s literature. 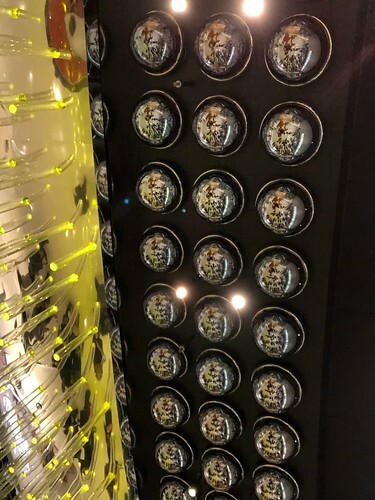 The powerful links between serialized novels, Hollywood adaptations, and books as portals for lucrative transmedia franchises was fully realized across the decade of Harry Potter novels that led to films, fan fiction, and even theme parks. The advances in technology that were in lock-step with the possibilities of mass-market profit were both suggested by and unable to be anticipated by the New London Group. Multiliteracies, in classrooms and in broader society, highlight how even liberatory possibilities of literacies–to reach new audiences and foment new voices–are often hemmed in by the auspices of those that wield societal power. We are thrilled with the amazing contributions in this issue. I am pasting the table of contents below, but encourage you to visit the Theory Into Practice website to access the abstracts and full manuscripts for the entire issue. I hope you check these articles out! I would be remiss to also point out I published two books this year as well. I’ve written about Good Reception here and Alternate Reality Games and the Cusp of Digital Gameplay here. Additionally, I read substantially fewer gaming-related books as that work is now moving toward being submitted for publication. Initial work related to tabletop gaming came out earlier this year here and here. Moving on to things I read, the first book I finished this year (on January 4th) was Jane Mayer’s Dark Money. Perhaps the most relevant and accessible book that illustrates the paths that lead to Trumpism, the lessons here continue to resonate. A couple of novels I enjoyed: Celeste Ng’s Little Fires Everywhere and Dexter Palmer’s Version Control both played with precision and form. They were quick reads that still felt sumptuous. Speaking of form, I read Michael Ondaatje’s Coming Through Slaughter for the first time and the possibilities of that book as a template for conveying ethnography have had me mulling. Likewise John McPhee’s Levels of the Game is a book length reckoning of one tennis match that continues to make me think about how to step up the narrative threads in academic writing; I’m pretty sure this will make some of my graduate syllabi in the near future. In terms of YA books, I re-read Cathy’s Book and read Nnedi Okorafor’s stellar Akata Witch both for separate projects, I hope to talk about in the future. I also really enjoyed both of Becky Albertalli’s books this year and look forward to the film adaptation Love, Simon (even if I don’t love the film’s name). Finally, while Meet Me in the Bathroom was the quicker read about hipster music culture, Damon Krukowski’s The New Analog has been the book that has most directly affected some of my recent research. The related podcast series has been illuminating as well. In terms of music, Vince Staples, SZA, Bleachers, and Rostam have all gotten consistent rotation. Daniel Caesar was the most surprising artist I learned about early on this year. I’ve probably streamed the Praise Break EP a couple dozen times. The 1-2 punch of the Casablanca interlude and “We’ll Always Have Paris” has been a musical highlight. This upcoming Monday kicks off the first class I’ll be teaching for STEP: ED289 – The Centrality of Literacies in Learning and Teaching. This class is a two-week mad dash through all things literacies for secondary teacher education students. Recognizing the limitations of the course in terms of time and energy (students take the class in the afternoons after a full day at a local school site), I am hoping to center an ethos of critical, humanizing, and expansive literacies. 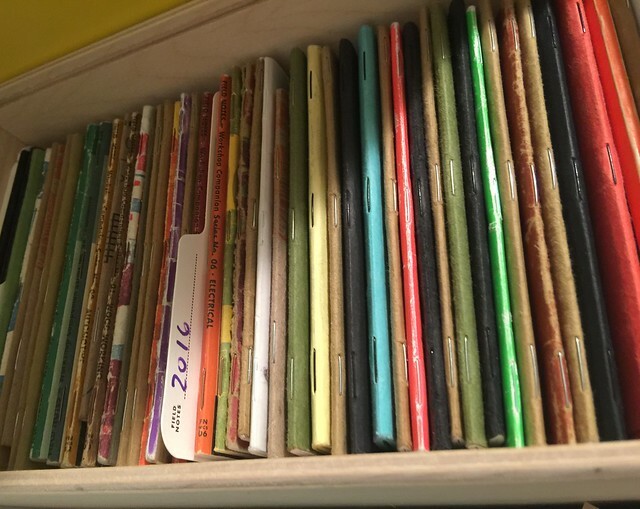 You’re welcome to take a look at our perpetually-being-tweaked-syllabus here. 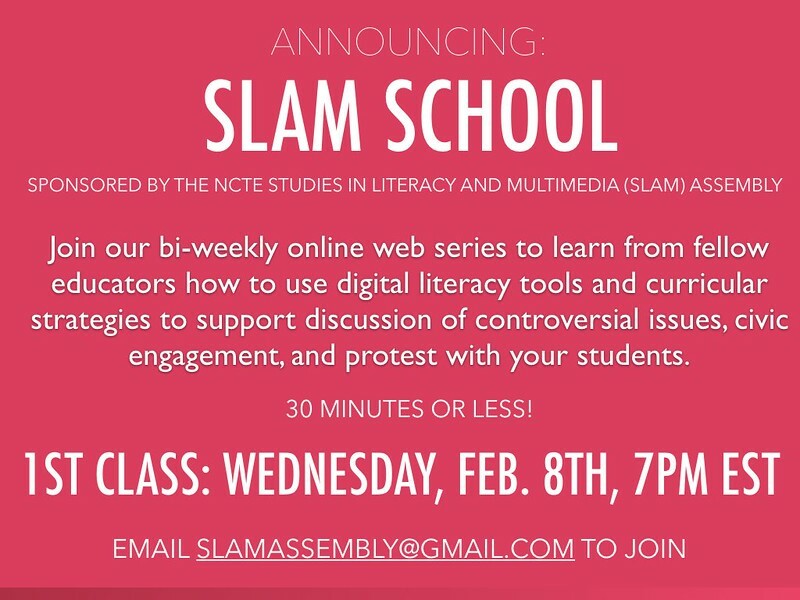 As part of the design of this course, I am also hoping to illustrate to students the broader critical community of literacies educators I regularly learn from. In this spirit, we will be hosting three shorter Twitter chats over the next two weeks, utilizing my new favorite hashtag, #schmiteracies. I’ll send a #schmiteracies tweet with better ETAs on each of the days above. If you have questions prior to chat – feel free to reach out! I am co-editing an upcoming special issue of Learning, Media and Technology alongside Thomas M. Philip with the theme noted above. The full CFP can be found here and I am also pasting the details below. This special issue will present research exploring how the current nationalist and oppressive sociopolitical environment–seen globally–shapes youth identities and learning practices in both formal and informal environments. We want to interrogate how learning and the role of technology are affected by a political climate that sees a rise in global far-right movements, as evidenced by the wake of prominent recent events like Brexit and the 2016 U.S. presidential election. As guest editors in the U.S., we are particularly cognizant of a localized context in which a successful presidential campaign can be built on foundations of racism (Kendall, 2016), religious intolerance (Rosenberg & Ainsley, 2016) sexual assault (Burns, Haberman, & Martin, 2016), misogyny (Khazan, 2016), xenophobia (Sargent, 2016), and a disregard for science and the environment; we see today’s political actions shaping the landscape of learning and technology long after the administration of individual leaders. As a result, the papers in this issue will explore the broader landscape of the current political climate, rather than focusing exclusively on specific figures and events. They will offer new understandings and narratives of learning, engagement, and resistance. The intersections of learning, technology, and politics are pervasive in the lives of young people; exploring how information and technology shape the contours of the spaces in which learning takes place, we seek to center the voices and needs of youth. Further, this issue underscores that these shifts are happening globally and we are specifically interested in looking at how nationalism and far-right movements affect youth learning and engagement in myriad, global contexts. We also see broader civic, educative, and social-emotional concerns arising at the same time that one-to-one digital device initiatives and emphasis on STEM learning claim to be ushering in equitable learning opportunities for all youth regardless of socioeconomics, culture, race, or gender. In considering how issues of capitalism and neoliberalism underpin both the educational shifts in classrooms and the ushering in of a nationalistic political paradigm, this issue will highlight the fundamental role that media and technology play in this specific moment. We are mindful that the contexts of learning are part of the current political moment and tied to neo-liberal capitalist practices. How are youth identities being shaped by the current landscape of nationalism, exclusion, and symbolic violence, particularly through new media? What role does technology play in reinforcing and/or resisting hurtful discourses? In what ways can empirical research around learning and technology take up an emphasis of solidarity and/or resistance to exclusionary educational and social policies? How does symbolic violence in social media shape feelings of nationalism and identity, particularly for youth? How are digital tools, artificial intelligence, and machine learning shaping global contexts such as the election of Trump and Brexit? How are youth learning about, responding to, and unpacking the contexts of neoliberal society in both formal and informal environments? What tools are leveraged in this discourse? How are contemporary social science and educational methodologies illuminating or occluding dominant hegemonic discourses within the work conducted in schools? Full papers are expected to be between 6,000 and 8,000 words (please refer to the journal website for full ‘instructions for authors’). All papers will be subject to the usual blind reviewing and refereeing processes. Burns, A., Haberman, M., Martin, J. (2016). Donald Trump apology caps day of outrage over lewd tape. New York Times. Kendall, B. (2016). Trump says judge’s Mexican heritage presents ‘absolute conflict’. Wall Street Journal. Khazan, O. (2016). The Lasting Harm of Trump-Style Sexism. The Atlantic. Rosenberg, M. & Ainsley, J.E. (2016). Immigration hardliner says Trump team preparing plans for wall, mulling Muslim registry. Reuters. Sargent, G. (2016). Trump returns to his old standbys: Xenophobia, hate, lies, and yes, mass deportations. Washington Post. 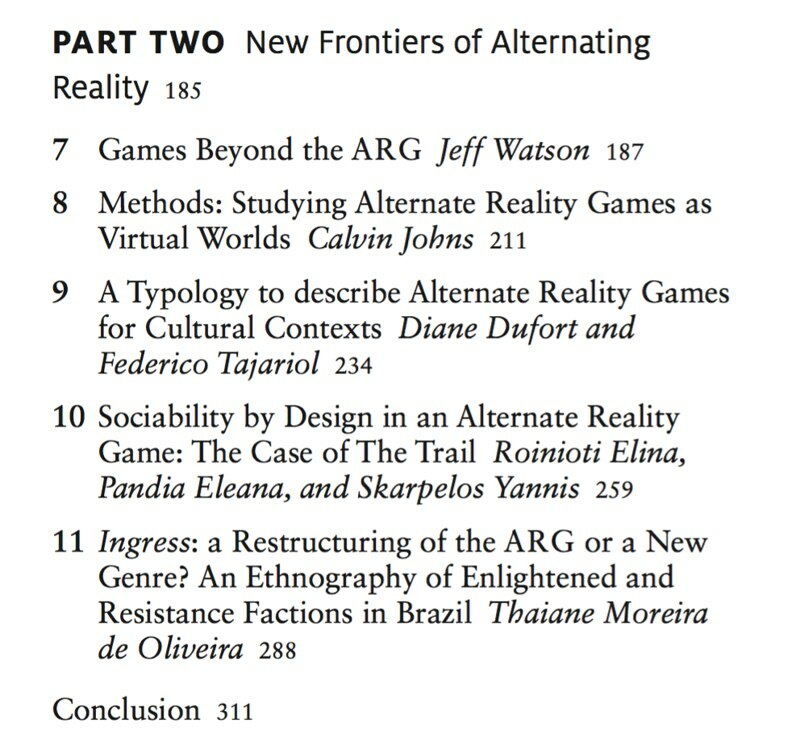 I am thrilled to announce the release of the recent edited volume, Alternate Reality Games and the Cusp of Digital Gameplay, as part of Bloomsbury’s Approaches to Digital Game Studies series. The book, co-edited with Greg Niemeyer examines foundational tropes in ARGs, pushes towards new conceptions within the genre, and challenges how “digital” game studies reconcile with games that take place in the physical world around us. 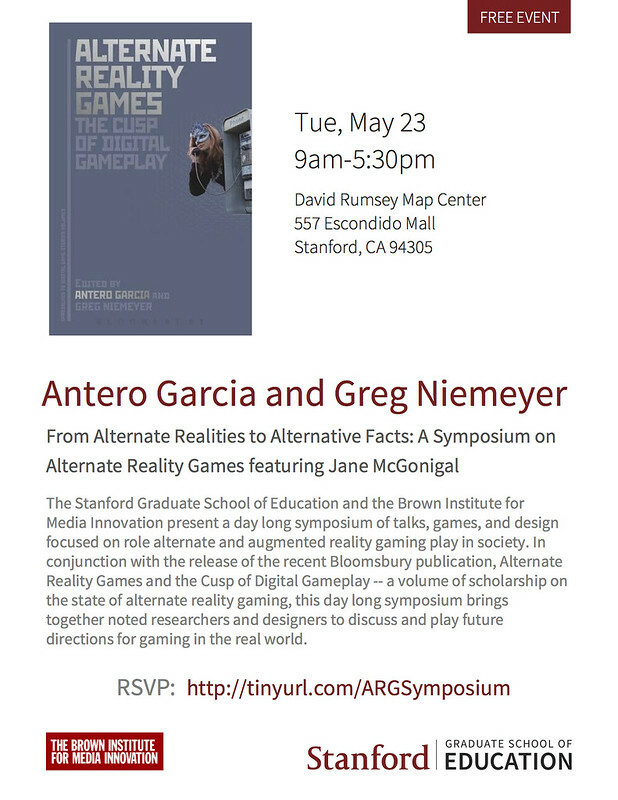 In conjunction with this release, Greg and I are hosting a day-long symposium on ARGs on May 23 at Stanford University. 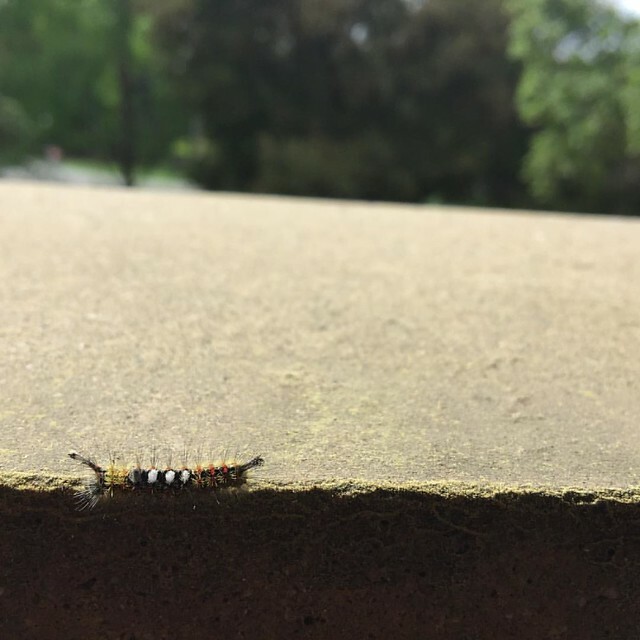 This free event begins with a morning of panels and academic talks related to the contemporary state of ARGs, includes a session of ARG-related playtests on campus, and culminates in an afternoon talk by Jane McGonigal. The event is free (flyer above) and you can register here. 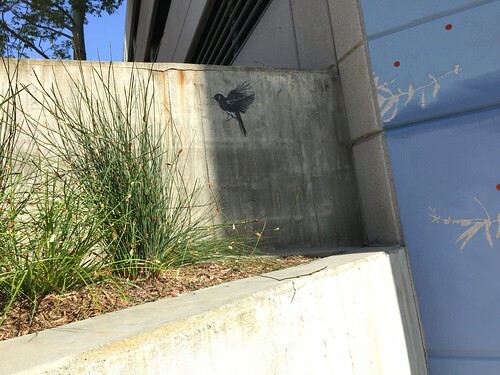 Alternate Reality Games (ARGs) challenge what players understand as “real.” Alternate Reality Games and the Cusp of Digital Gameplay is the first collection to explore and define the possibilities of ARGs. Though prominent examples have existed for more than two decades, only recently have ARGs come to the prominence as a unique and highly visible digital game genre. 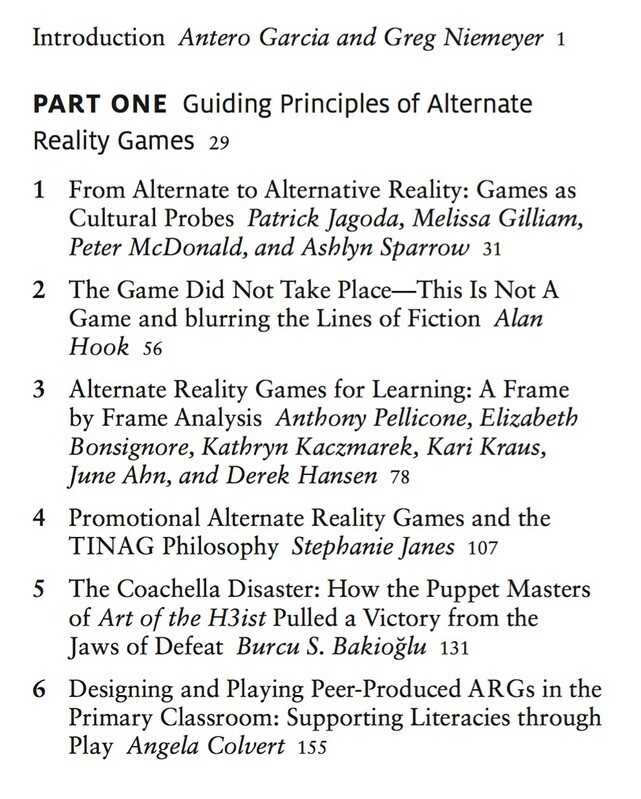 Adopting many of the same strategies as online video games, ARGs blur the distinction between real and fictional. With ARGs continuing to be an important and blurred space between digital and physical gameplay, this volume offers clear analysis of game design, implementation, and ramifications for game studies. Divided into three distinct sections, the contributions include first hand accounts by leading ARG creators, scholarly analysis of the meaning behind ARGs, and explorations of how ARGs are extending digital tools for analysis. 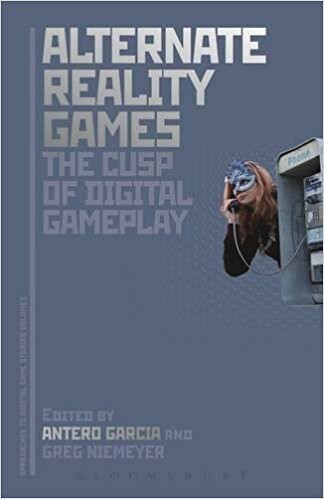 By balancing the voices of designers, players, and researchers, this collection highlights how the Alternate Reality Game genre is transforming the ways we play and interact today. Please get in touch if you have questions or want to learn more about either the book or the event!